Forget about downtime! With failover cloud server your project will always be up and running. Cloud VPS is built with redundancy in mind. User data and physical nodes of the system are constantly replicated within the cloud. Data replication allows to keep your websites up on another server should any part of the cloud fail. Infiniband — a 56 gbit/s network with a latency of 0,7 ms.
Two clusters exchange information as if they are located on one physical server. 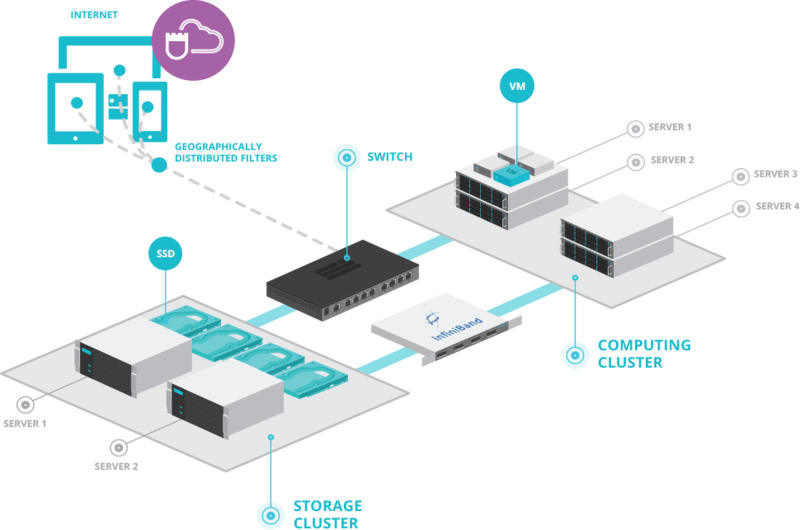 Storage cluster contains user data from all the virtual machines. A distributed redundant system enables to automatically recover information in the event of system failure. Data in the storage will be available whenever you need them. Virtual machines are running in thecomputing cluster. If a cluster node fails, virtual machines will be automatically restored on available nodes. 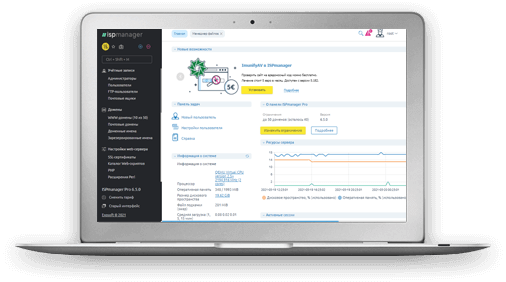 Enjoy your cloud server experience with the free ISPmanager control panel, even if you’re a beginner. verything you need is available straight from the browser window: user and domain management, mail setup, backups creation, file upload, DNS, FTP, PHP, Databases and much more. Our system is built with redundancy. User data and physical nodes of the system are constantly duplicated. When one of the systems fail your project will be immediately restored on an available node. Data transfer between clusters is maintained through a high speed 56 Gbit/s InfiniBand network. Read/write operations are done with an SSD. Sites are moved to a working node smoothly and high speed disks allow to access your projects immediately. You no longer need to suspend your servers for maintenance. When one server is suspended, your project will run on another one. Users won’t suffer any service downtime. Test file transfer speed to our servers, as well as connectivity to Internet host nodes using our Looking Glass service. Ping, traceroute and shroute tools are available. A cloud server is a fully functional system running in a multi-tenant environment. In terms of management, a cloud server is much similar to a traditional server. Administrator of the server server has root permissions to manage the entire system, except its hardware. Why should I use KVM virtualization? KVM virtualization allows the allocation of OS kernel to each cloud server, so that a virtual private server fully simulates the performance of a typical physical server. It has all parameters that a real computer has, such as CPU, RAM, disk space, operating system, root-admin and any number of users. The only thing that the virtual server doesn’t have is its hardware. What software can be installed on a cloud server? You can install the following operating system on your sloud server: CentOS, Debian, FreeBSD, Windows Server 2012. If you want to install another OS, which is not included into this list, we can discuss it. Please note, software programs that you install on your server will occupy the hard disk space. You can easily resize your KVM disk by submitting a ticket to our Technical support. What is the difference between a cloud server and VPS? Our cloud system is built with redundancy. User data and physical nodes of the system are constantly duplicated. When one of the systems fails, your project will be immediately restored on available nodes. The latest backup copy of your project will be available at any time on the replication server. How are bandwidth charges calculated? Strength of a DDoS attack is not taken into account. We bill only “white” bandwidth generated by the visitors of your site. During the day we measure bandwidth rate of your server. Both incoming and outgoing traffic is calculated. The top 5% of the traffic is cut off, and the remaining amount becomes the billable use for the current day. Example: on the 1st of May your bandwidth was 5 Mbit/s. Overage is 4 Mbit/s (1 Mbit/s is included into your tariff plan). The next day you will be charged for 4 Mbit/s per day. Thus, on the 2nd of May you will be charged 4*8 / 31 = 1,03 eur. 4 Mbit/s – resource overage 8 eur – the cost of 1 Mbit/s per month 31 – number of days in May Daily charges are fair to clients. Even if your website traffic suddenly increases, you won’t have to overpay for the whole month. You pay only for “peak use”. Pay only for what you use! Cloud servers are located in our own data-center in Moscow, Russia.